It was a damp and foggy morning where we'd camped at Riverwalk RV Park, Fortuna. We learnt that it is often like this along the coast. We took the time to transfer photo's to the computer, charge camera batteries and check emails while we waited for the damp to lift. One thing we found delightful at this park were their log cabins. Worth a thought if you find yourself in the area and want a rustic experience. The wait was worth it as we left camp late morning with the air temperature considerably warmer and visibility a-okay. We turned off Highway 101 and rode through the 'Valley of the Giants', the famous Californian Redwood forests. The trees were stunning. Half-way along we stopped at a little place called Myers Flat for a drink. Paul got a coffee and, after talking to a cyclist, who has waited for two years to get back to this shop to have a milkshake, I decided to have one too. Boy, it was the best chocolate milkshake I've ever had. It was nearly 1.00pm when we left Myers Flat and continued on through the Redwood forest. Eventually we left the tall tree area and found ourselves winding through the hills following the South Fork Eel River. We got fuel at Garberville and nearly vaporised in the heat. It was a shock after the coolness of the Redwood forests. We had no option but to keep pushing on. Luckily though, a little way down the Interstate, we turned off on to Highway 1 to follow the coast road to Mendocino. It was very twisty and steep but a lovely ride - and cooler. We eventually hit the coast which was foggy and very cold, a vast difference from the heat inland! Visibility was at times severely reduced due to the low cloud. The roads wound their way around the coastal hills. We were very pleased to roll in to Mendocino for a hot drink and warm up. First impressions were of a delightful town but as each shop we approached closed (it was 4.00pm) we were getting a little desperate. However, those closures turned out to be a blessing in disguise. We found a shop called 'Frankies' that served fabulous food and had an atmosphere to match. There was a whole lot more to explore here but the diminishing day meant we had to get going as we had a date at Cloverdale. 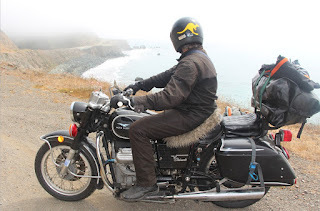 We wondered just how much more cold we could endure as we rode along the foggy and damp coastline. We were pleasantly surprised when a few kilometers inland the cloud disappeared, the sun came out and it was the most glorious late afternoon ever. Hard to imagine the differences in such a short distance, but there were no complaints here. We found ourselves riding through the beautiful Sonoma Valley, full of wineries and heavily fruited orchards. It was glorious. The early evening light made the surroundings glow. We crossed a county line and descended from the plateau to the valley below and on to Cloverdale. We were surprised to whiz past a corner and have a deer standing there wandering "Who was that?" We arrived at David & Candi's home at 7.00pm. We were so pleased to have finally arrived. We feel like we've done three days riding in one today! We then encountered a wonderful surprise to find our friends Patrick & Regina there. We couldn't have been more happy. David & Candi cooked up a fabulous meal for us all, washed down with some great local wines. Much chatter ensued and we enjoyed sitting back, relaxing and being looked after, especially after the last two long days. It couldn't have been a nicer evening. And then to top it off, Patrick got us to all stand up and look south east high up in the sky. To our amazement, and right on cue, Patrick pointed out the International Space Station as it passed overhead at a great speed. The left-hand streak in the photo below is the space station - a classic example of my night-time photo-taking prowess...!! !